C'mon down to The Lou, where the beer is always frosty and the fans are all-in, and the most popular local Cards hangout has your name all over it! We've got your dream covered here at PersonalizedThings by Exposures with our St. Louis Cardinals Personalized MLB Pub Sign Framed decor. This MDF vinyl-wrapped frame and glass St. Louis Cardinals decor is a must-have addition to your home or office Cards shrine. Just let us know what nickname or name you want added to the marquee — it's that easy. 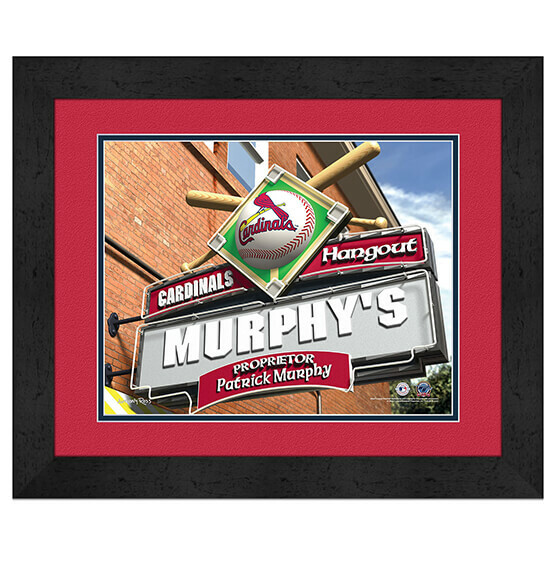 With its brilliant St. Louis Cardinals colors and team logo, this framed print makes a great gift for yourself or the Cards fan in your life.